A brand is a name, term, design, symbol, or other feature that distinguishes an organization or product from its rivals in the eyes of the consumer. Brands are used in business, marketing, and advertising. The key components that form a brand's toolbox include a brand’s identity, brand communication (such as by logos and trademarks), brand awareness, brand loyalty, and various branding strategies Many companies believe that there is often little to differentiate between several types of products in the 21st century, and therefore branding is one of a few remaining forms of product differentiation. Brand value, not to be mistaken with brand equity, is a phrase used in the marketing industry to describe the value of brands based on the implication that the owner of a well-known brand name can generate more money than than the owner of a less well known brand name. Brand valuation is the estimation of a brands total value. This is achieved by following the International Organization for Standardization's ISO 10668 standard which maps out the appropriate process of valuing brands by adhering to six key requirements: transparency, validity, reliability, sufficiency, objectivity and financial, behavioral and legal parameters. A brand is an intangible asset (name, term, design, symbol or any other feature) which identifies one seller's product from another and is often a corporation's most valued asset. 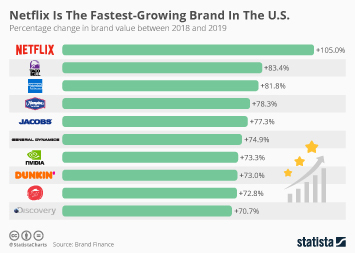 As of 2018, Amazon was the most valuable brand in the world with a brand value close to 151 billion U.S. dollars. Apple and Google were the second and third most valuable brands, with brand values of 146 billion U.S. dollars and 120 billion U.S. dollars respectively. Strong brands enhance business performance primarily through their influence on three key stakeholder groups: (current and prospective) customers, employees and investors. Brands influence customer choice and create loyalty; attract, retain, and motivate talent; and lower the cost of financing. Google is one of the most recognized brands in the world. It was also ranked as the most valuable technology company worldwide with a brand value over 302 billion U.S. dollars in 2018. In terms of fast moving consumer goods, Gillette was the most valuable brand with a brand value of about 18.2 billion U.S. dollars. As of 2018, Google was the most valuable brand in North America with a brand value amounting to approximately 302 billion U.S. dollars. SAP was the most valuable brand in continental Europe, valued at approximately 45.2 billion U.S. dollars in 2017. The influence of brands on current and prospective customers is a significant driver of economic value. By expressing their proposition consistently across all touchpoints, brands help shape perceptions and, therefore, purchasing behavior, making products and service less substitutable. Brands, therefore, create economic value by generating higher returns and growth, and by mitigating risk. More interesting topics from the industry "Worldwide"